It was time for Beer and Pizza! Yes, we finally made it back to Greenport, NY. Yes, we had some excellent pizza and beer. I’ll tell you about that in a moment. On the other side of the ledger, we didn’t revisit our Lamborgueza moment. It won’t be on the menu until Spring. We will report back. And, we didn’t get more honey at Coffee Pot Cellars Winery from bee mistress Laura Klahre. Pesticides are messing with her bees and the fall harvest just wasn’t. I so wanted that honey for my tea, and to enjoy with some crisp apples for a wonderful dessert. Oh well, springtime isn’t that far off, is it? So, what about that pizza? Marian and I arrived in Greenport, all ready for lunch. We wanted to repeat the Lamborgeuza experience but it was not to be. On our last visit, Marian noticed Emilio’s and surmised that some great pizza could be had there. This visit, we learned she was right. A couple of slices of the “everything on it” pizza and a couple of bottles of Bluepoint Brewing’s Toasted Lager. Great pizza with a crispy crust! Not oily and greasy! Try it, you’ll like it. We did. 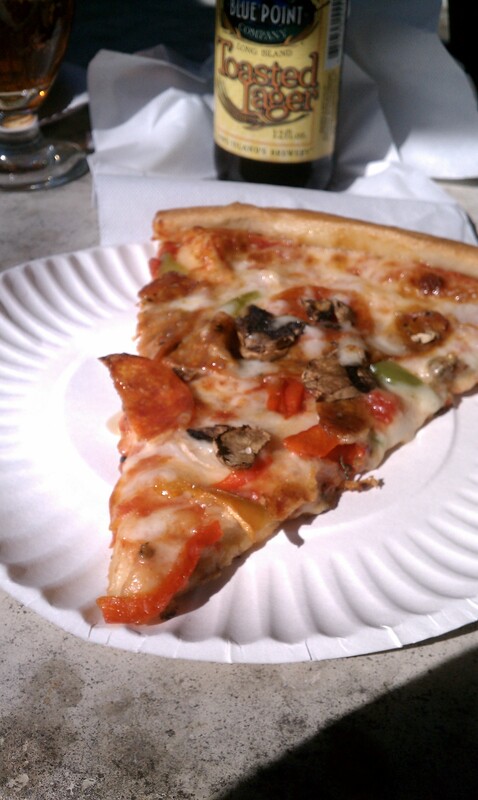 One advantage of the Toasted Lager was how well it went with the pizza. Another was to provide us with a reference for the beers and ales we were about to taste at the Greenport Harbor Brewing Company. Last time in Greenport, we just missed a tasting at the brewery. Not this time! Here is the story. You get to enjoy a tasting of beers and ales, and your glass is a keeper. All for $8.00. If you bring or buy a growler, the brewery will oblige you, for a fee of course. The only thing you can’t do right now is buy a pint and relax. The byzantine NYS Liquor Authority regulations have not yet been satisfied for that seemingly simple offering. 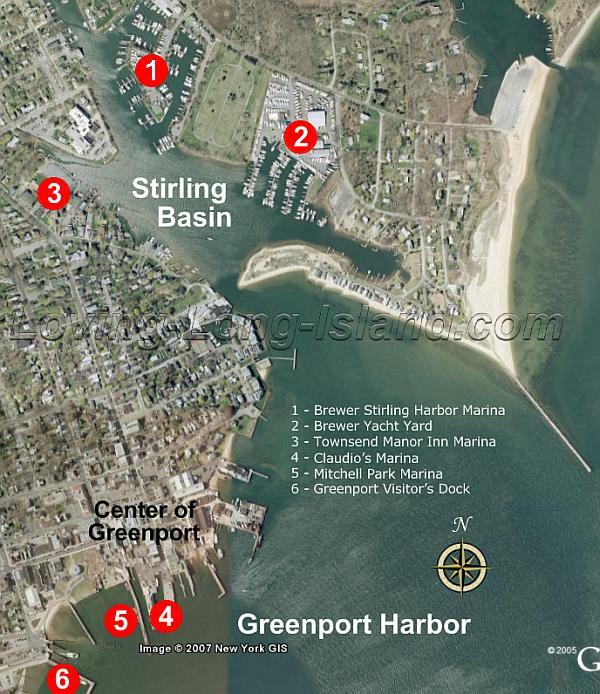 No worries, Greenport Harbor is working on it. The venue is a very friendly “belly up to the tasting bar” scene with seats for conversation, and some real brewing materials stored in sight of the crowd. Some visitors had brought their kids, who engaged in some quiet play. No, they were not tasting the brews. On the tasting bar were big jars of crisp, salty pretzels. Just right with the beers. Wineries should take note. Once, wine-tasting crackers were always on offer, but it has become rare today. 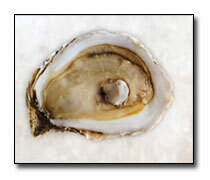 By the way, the brewery is hosting Oyster Fest 2013 on November 10, 2013. Come, enjoy the oysters, brews, and friendly fellowship. So, which beers did we try? All the ones on offer. Here is the tasting card, in the order of tasting. Harbor Ale – Dry in taste and amber in color. Great hoppy nose and bitter taste without a hint of the sweet bottom note found in many beers. This was the best all-around pour in the lot. I’d compare it to the Toasted Lager we enjoyed with our lunch. Black Duck Porter – Wow! Like a coffee nose and an espresso taste? This is your pour! Coffee pervades the nose, flavor, and color. What to eat with this porter? We thought of all things fried, from zucchini to oysters. In other words, this drink works with bar food. Hey, what about some grilled hot sausage? Try it! Oyster Stout – One of the women “behind the stick” asked a patron whether he had any seafood allergies. This stout is brewed with real local oysters in the mix. Yes, they stay in the brew for two weeks, adding that special “je ne sais quoi.” Relax, you don’t taste anything “fishy”. This is a delicious but not assertive brew. The sample wasn’t pulled with the beauty of a Guinness stout, but what is? Marian and I agreed that the stout was a less assertive and controversial version of the Black Duck. Very friendly, but less exciting. Devil’s Plaything IPA – Double Wow! This is a hoppy (no surprise, as it is an IPA) higher-alcohol brew with a basil – lemongrass nose. Yes, this one is “out there”. Perhaps it would be wonderful with very spicy Asian foods like Thai curry or spicy dumplings. You will be surprised, and pleased by the Devil’s Plaything. Leaf Pile Pumpkin Ale – There is no pumpkin in this Ale. There is pumpkin spice, however. Marian remembered my sweet potato latkes from last year’s Hanukkah and decided this would be a perfect pairing. Sweet potato fries, apple fritters… you get it. Some fruit, some sweet, some savory. Don’t be put off by the pumpkin in the name. It’s good. 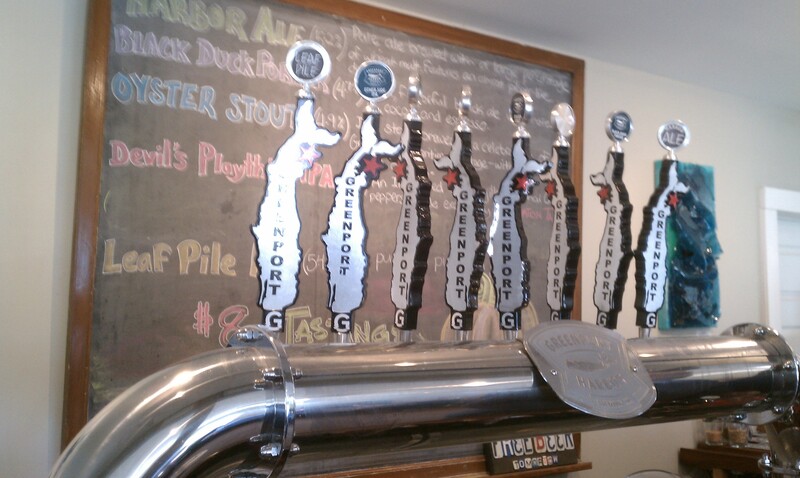 We give Greenport Harbor Brewing Company “Two Pints Up”… we both enjoyed our visit, and so will you. Don’t worry, we didn’t conclude this after getting sloshed, It was a sober assessment. The after-taste I’m talking about was a long slow drive home on a beautiful, sunny afternoon. This was probably the acme of leaf peeping on the East End, so we looked and decided it was grand. If you are really in need of a leaf fix, head for Vermont. Otherwise, the friendly atmosphere and beauty of the North Fork will compensate for the lack of maples. I want to visit the Old Mill Inn to have lunch by the Mattituck Inlet. Marian wants to visit the Kontokosta Winery in the Greenport area. We both want to visit One Woman Winery again to see what’s new. Stay tuned, and enjoy your trip around town!